Inverted Yield Curve: Bond Market Flashes Recession Warning, Stocks Drop The bond market flashed an ominous warning Friday, as the yield on long-term government debt dipped below that of short-term bills. That unusual situation often signals a recession on the horizon. 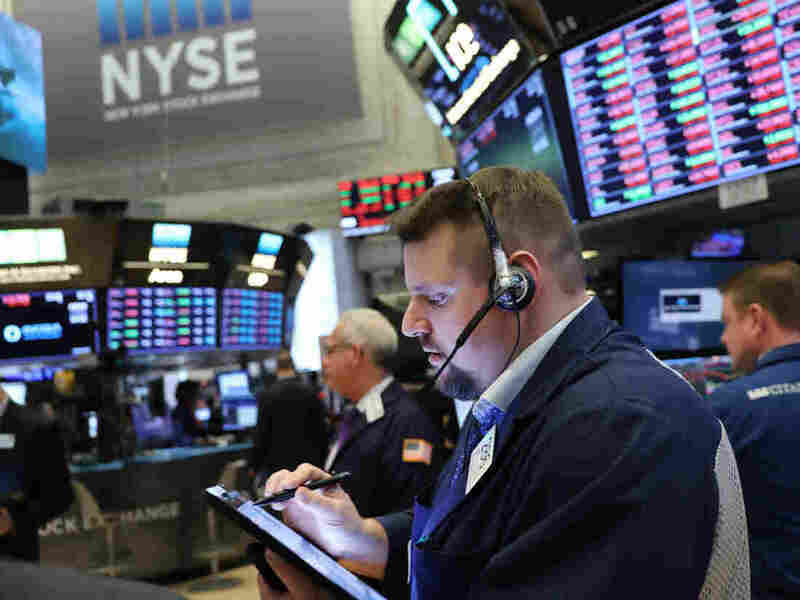 Major U.S. stock indexes fell Friday as short-term Treasury yields exceeded those on long-term bonds, in what some analysts consider a sign that a recession may be coming. The stock market tumbled Friday as investors digested an ominous warning sign: Interest rates on long-term government debt fell below the rate on short-term bills. That's often a signal that a recession is on the horizon. The Dow Jones Industrial Average fell more than 460 points Friday, or about 1.8 percent. The broader S&P 500 index fell 1.9 percent. Ordinarily, the yield on long-term debt is higher, just as 10-year certificates of deposit tend to pay higher interest rates than three-month CDs. Are We Ready For A Recession? Bond watchers get nervous when that typical pattern is turned on its head. "We don't see that occur that often, but when it does, it's almost always bad news," said Campbell Harvey, a professor of finance at Duke University. That's why warning lights started flashing Friday morning when the yield on the 10-year Treasury note slipped below that of the three-month bill. The last time that happened was just before the Great Recession. Harvey has been keeping a close eye on these rare, "inverted" yield curves for more than 30 years and treats them as a kind of early warning signal. "My indicator has successfully predicted four of the last four recessions," he said, "including a pretty important call before the global financial crisis." Harvey won't actually forecast a recession unless the yield curve stays inverted for at least three months. But even a flat curve — in which long-term yields are just slightly above short-term yields — could be an indicator the economy is losing steam. "It might be that we dodge a recession, but the economic growth will be lower — much lower," Harvey said. On Wednesday, the Federal Reserve lowered its own forecast of economic growth, to just over 2 percent for the year and signaled that it was unlikely to raise interest rates in 2019. Fed Chairman Jerome Powell said slowing growth in China and Europe present "headwinds" for the U.S. economy. And ongoing trade disputes are not helping. "There's a fair amount of uncertainty," Powell said. The unemployment rate is at a low 3.8 percent, but the economy added only 20,000 jobs in February. That was far fewer than projected by economists and the smallest gain since September 2017.